This is probably the most working-class of Paris’ arrondissements (administrative districts). Perched on a hill, it boasts a park, Parc des Buttes-Chaumont, which is unique in that it is undulating. The 19th arrondissement is home to Belleville, which some might say is becoming Paris’ second Chinatown. Belleville has a cosmopolitan atmosphere, yet doesn’t attract many tourists. Among the distinguishing features of the 19th arrondissement are the small houses in the Mouzaïa neighbourhood, but also a Russian Orthodox church hidden at the end of an alley. The Canal de l’Ourcq and its basin provide an oasis lined with cinemas and neighbourhood bars which are very lively in the summer, when the Provençal culture is strictly applied: pétanque + Ricard (an anise and liquorice-flavoured alcoholic drink) in the afternoon, then chilled rosé wine in the late afternoon along the edge of the basin, which joggers share with families and students here to enjoy themselves for little to no cost. 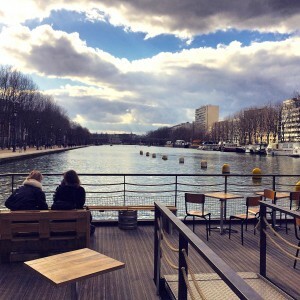 The 19th arrondissement and its canal are definitely among my favourite spots in Paris. Write me for a private tour or check the dates for the next group tours.